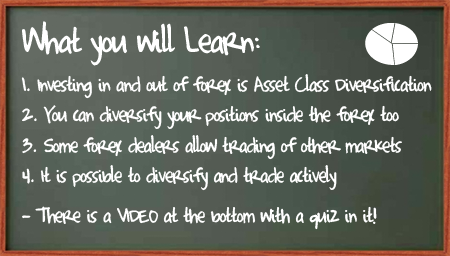 The first way to diversify is to make sure you are not exclusively invested in a single asset class. For example, being solely invested in the forex, or stocks, or bonds leaves you exposed to systemic risk. Systemic risk is the type of risk that you can’t get rid of. Systemic risk covers anything from your account being frozen through insolvency to catastrophic volatility in a particular market because of an unexpected unknown. The second way to take advantage of diversification is by creating variety in the way that you trade or invest within an asset class. For example, if you are managing your forex positions one trade at a time, or with only a single strategy, you are exposing yourself to focused risks without any way to offset them. This creates volatility within your account, and account volatility can mess with your trading mentality and lead to losses. Here are a few simple ways to start building a diversification strategy. You will find some example allocation ideas in this lesson and a little more detail in the video.